So you woke up today and your kid has a runny stuffy nose. You feel their forehead and there might be a fever there. That’s right you are about to deal with a cold. So what do you? Do go to the medicine cabinet grab every drug you possibly find? What do you do if your babies too young for medicine? What do you do if you don’t have the right kind of medicine or family have one symptom? Here is my number one go to remedy for a common runny nose. 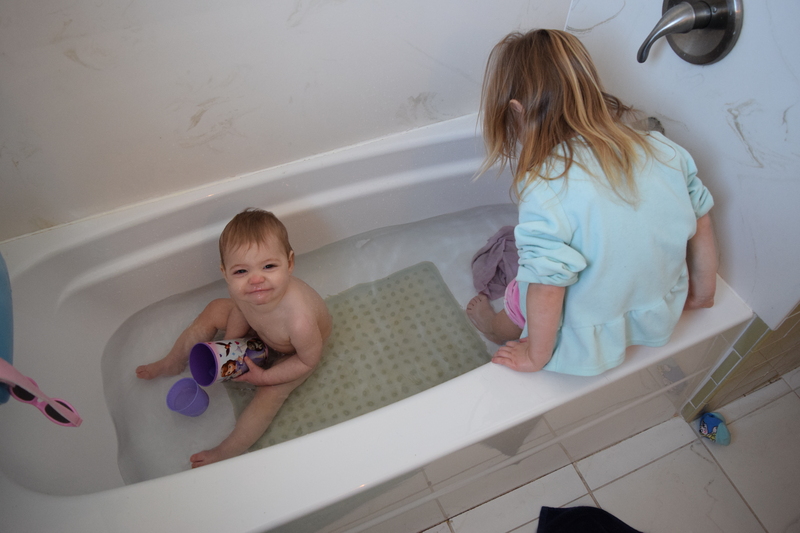 I take the girls, my Kindle, and the humidifier I put them in the bathroom. We have a cozy downstairs bathroom but it gets chilly so I also bring my heater. I turn the heater on a higher temperature, 70-72 degrees and crank the humidifier on high. What I am trying to do is create a sauna like environment. Using the humidifier creates the “steam bath” without wasting water. This way you can also keep the water at a baby safe temperature but still get the “steam”. I also add 3 drops of Tea Tree Oil to the humidifier to create a cleansing mist; acting as a diffuser. Now I draw a warmer than normal bath; this is going to be a long bath so I make sure the water won’t cool off quickly. 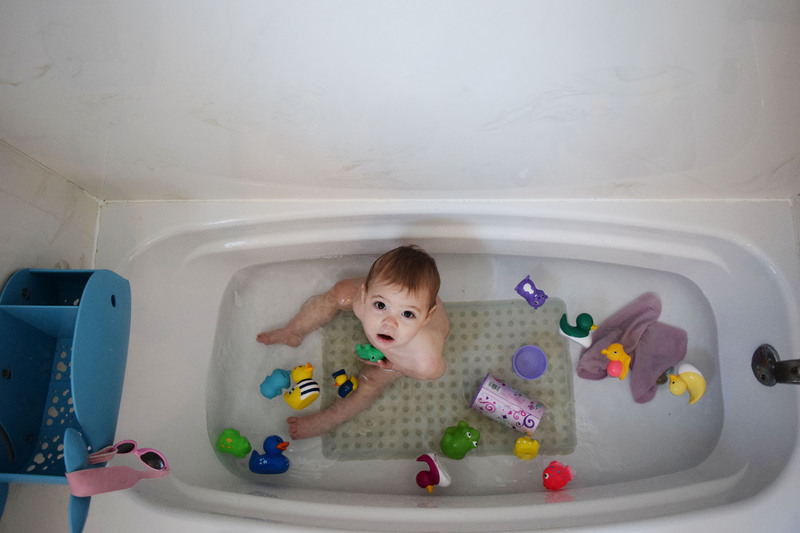 I the make the tub baby friendly by adding toys and baby safe bubbles. Sometimes big sisters will help entertain baby too. Soon the room will fill with steam and the snot will start flowing! Once the fountain begins with will not stop. Keep a dish rag on hand and wipe as needed. I usually keep this going for 30 – 45 minutes. The snot should eventually loose its color but the first 10 minutes or so will be neon green and yellow. For us this whole routine end when baby is through with the bath, the water turns cold, the humidifier runs out, or the snot stops flowing. Once we are out of the tub I saline Tiny’s nose to ensure she can breath for a little while. *Bonus: this always helped Tiny sleep during a bad nap. 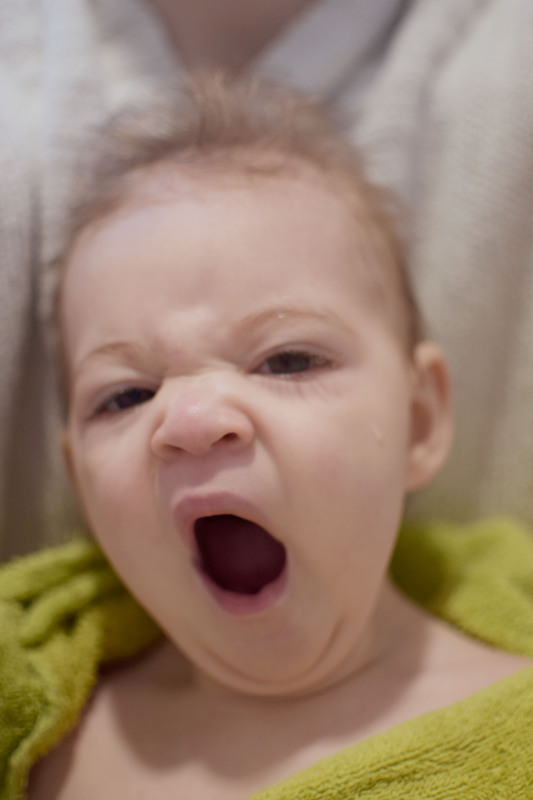 Try to plan this before a normal nap or bedtime and you might get some solid rest. While this is not my only method of handling a cold it is my first. I avoid medication if I can, plus until 2 most medications are not “cleared” for infants. It is a great time for everyone involved, Destructo included.